Homefield Self Catering01981240859work01981 240859fax Self-cateringA spacious home from home self-catering bungalow, adapted for wheelchair access. Ideally suited for groups with someone with very limited mobility. Enjoy excellent views of both Wales and England, as well as our 12th Century Castle. Homefield is located on the Three Castles Walk of Grosmont, Skenfrith and White Castle and the Four Castles cycle route which includes Abergavenny, and very close the Offas Dyke Path. 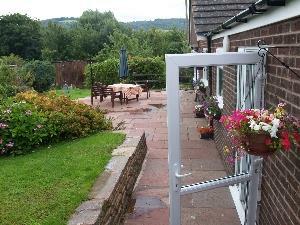 Set in Monnow Valley, on the edge of the Golden Valley, close to the Wye Valley and the Brecon Beacons National Park. A spacious home from home self-catering bungalow, adapted for wheelchair access. Ideally suited for groups with someone with very limited mobility. Enjoy excellent views of both Wales and England, as well as our 12th Century Castle. Grosmont and its stunning scenery is an ideal location as a base for walkers, birdwatchers, photographers and sightseers alike. Mobile hoist and other disabled equipment Children welcome from any age. Approach from road via driveway with a slight incline. Flat parking to front or side of property. Main access from (side) parking area via ramp with hand rail to large rear patio. From the patio access via low threshold into conservatory and then via ramp with wall hand rail into kitchen. Second access from the patio via low threshold door into specialist room with en-suite wetroom, straight access to main hall and into kitchen or lounge. Standard width inner hall & doorways.